My first trip to New York City was just after my freshmen year of college. My dad gave me a choice between getting a car (likely candidate: Toyota Camry about 10 years old) or a trip to NYC. I said both—buy a car in California and drive it to NYC. Thus began my penchant for road trips and love of NYC. I get so excited whenever a friend experiences the city for the first time. I think about what my friends showed me and what I’ve stumbled upon that I can share. I decided to take some of these thoughts and tips and share them here, in no specific order of importance. I also created a Google map below with links to all these places and more. When my friends from California took an east coast trip, we started off in DC and drove up to NYC (pit stop in Philly). Upon arrival in the city, one repeated request from Ruth was to walk the "Brwooklyn Brwidge.” Initially I thought it was a joke…we don’t walk the bridge. But it turns out she was serious, and now we often do walk the bridge, starting either in Manhattan or Brooklyn. It’s actually one of my favorite walks around the city. I find the architecture and accomplishment of the bridge, paired with the views of the water and skyline to be inspiring. Unfortunately, a few weekends ago they had some restoration or construction that’s been going on that took away from some of the experience. Alas. It’s still on my list. Central Park is massive. Within the park are a zoo, little amusement area, lots of lawns, a boathouse, fountains and more. I’ve also heard that you can get some of the best waffles available outside of Belgium at the food truck at the southeast corner of Central Park. I must try them soon! One great think about the park is the little break it gives you from the fast-paced city vibe. You can find a quiet spot and take in a little bit of nature with buildings peeking out here and there. No matter how many times I’ve been here I’m sure 1) I will have never seen everything and 2) I will get lost in at least one section. I thought I’d seen all the Egyptian exhibits, but stumbled upon a long room with a hallway on either side that I do not recall seeing ever before, and I had to leave before I could make it all the way through this new mysterious section. There are often neat exhibits that change throughout the year. I viewed one about a photographer in NYC and another about American women’s fashion throughout different time periods of our history. It’s a fantastic museum. Donations suggested, but it is in fact a suggested amount, and they will let you donate less. Haven’t tried nothing yet or a high five. I’ll report back if I do. My friend who lived in Queens for five years while working in Times Square and who graciously hosted us when we visited took us to the South Street Seaport. The cobblestone streets and location along the water with views of different bridges made this a prime spot for me with my obsession with night photography. 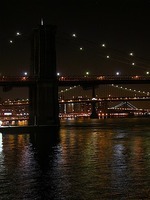 The lights of the city and bridges along with the water and reflections are just lovely. We generally just come for the view, but there are some eateries and shopping options here as well. Free ferry taken by commuters who work in the city and live on Staten Island. Also a free ferry taken by cheap tourists who don’t want to pay for a trip to Ellis Island but want to get a little closer to Lady Liberty. That’s right; I said it. The ferry that leaves from the southern tip of Manhattan, near Battery Park, takes you across the water to Staten Island, passing the Statue of Liberty from a little distance along the way. She’ll be on your right leaving Manhattan and on your left returning. The ferry runs about every half hour and takes about twenty minutes. I often just get right back on the same ferry to return (you still have to exit and loop around to get back onboard), so the full trip takes just under an hour. And recently gave me some much needed time to charge my phone. You can also walk up a few blocks to see the Charging Bull statue at Bowling Green and a few more blocks to Wall Street and the New York Stock Exchange. Within a few minutes walk is Ground Zero. I kid you not. We stood in line…to stand in line…to stand in line… And that was just to get in an elevator going up. There are also lines to exit and take the elevator down when you are finished. I’ve been to NYC several times over the past 10 years and just last month was the first time I actually went up the Empire State Building. Despite all the lines that took up about two hours just to get up to the observatory, the view is something you can only get from going far up a tall building (I hear the Top of the Rock is a good alternative, but haven’t done it.). Also, if you pay the extra money to go to the 102nd floor, there are less people up there in the enclosed top area. The first time I went to Spice Market was with friends to celebrate my birthday. We started with some delicious sodas—cherry lime and passion chili. The cherry lime was incredible. The food is the chef’s take and tweaks on street food he had while traveling in Asia. From the appetizers to the dessert, the food continued to amaze us by being more and more delicious. And it started out strong (complimentary snacks and then chicken samosas of note). The Ovaltine Kulfi was one of the best desserts I’ve ever had, and when I decided to branch out the second time to try pavlova for the first time…I was not disappointed at all. It was a perfect end to the meal. I also tried their new calamansi soda, which was very light, refreshing and tasty. All vegetarian restaurant with many mock meats in the Asian-inspired soul food. This is one of my all time favorites that a friend who went to NYU told me about. My first dish, and consequent go to ever since, was the butterfly soy chops with a raisin and poached pear topping. When I was able to branch out (or try some of my friends’ dishes), I did enjoy the oxtail soup, wings, BBQ ribs and mango chicken. It’s a tiny place, so you may have a wait, but I have also been seated immediately on occasion. This tiny restaurant lives up to its reputation. It is truly tiny and also very delicious. (Reservations can be made further in advance.) It was pouring outside when we dropped by to see if we could have dinner there. They had a cancelation and brought us in to wait for our table, where the current patrons were enjoying dessert. The host told us to go ahead and go up and moved a little to the right to reveal a little ladder with about three rungs that lead to a little sitting area and some shelves with wine. After a little confusion we climbed up to the waiting area that overlooked the entire restaurant and kitchen. Once seated, we enjoyed some tasty sides, a delicious bibb and beets salad and two fish dishes and beignets for dessert. Those last ones came with raspberry sauce and Nutella. Yum. Reminded me a little more of dense malasadas than other beignets I’ve had though. My absolute favorite frozen yogurt for the butter pecan flavor (great paired with granola and also combined with the coffee flavor if you like). The portion sizes are very generous; order accordingly. Great place for brunch with drinks, coffee, bread included in an affordable price for your meal. Helps that the food is good. The French toast is nice and fluffy. My go to dish is the Albuquerque melt, but it may be replaced now by the stacked chicken and egg tostada. One of my favorite places for brunch. Alice’s offers tons of tea selections, and I’ve yet to be disappointed by one. Ask your server for suggestions on what tea will complement your food. I like to get one of the towers so I can select scones, sandwiches and dessert. The scones are amazing as are the potato-chicken hash. The French toast is a bit like a cross between bite size French toast and bread budding and comes with fruit. 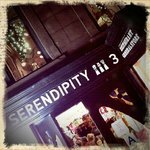 Made extra popular by the movie of the same name, Serendipity offers decadent desserts like frozen hot chocolate and my all time favorite, the Can’t Say No Sundae (humble pie, ice cream, fudge, whipped cream). The giant menus provide a wide array of food choices from salads to pasta to burgers and more. The Haight-Ashbury sandwich is my favorite (tons of turkey, avocado, tomato on pumpernickel bread with French dressing). Anticipate a very long wait for this restaurant to be safe. During the up to two hour wait times we've encountered, we often go to Dylan's Candy Bar just down the street and sometimes Bloomingdale's. When my friend was visiting NYC for the first time and we finished walking the Brooklyn Bridge, we asked what he’d like to do. He said go to a lounge. I thought, “Great. One thing I know nothing about.” I sent off a quick text and email to a few friends as my phone battery was at 7%. Yup, seven. A friend responded mentioning a place called Beauty and Essex so we decided to try it out. The façade may surprise you, with signs that say eat, drink, sell, pawn. The system may perplex you (stand to the right of the door if you don’t have a reservation; go to the left of the door to check in if you do have a reservation). Once you get inside though, it’s a really good time with an upstairs and a downstairs area and music to keep you moving and interested even if you have music A.D.D. like me. Also on weekends, some trains run differently or don’t run at all. Read the signs posted throughout the system. Permanent signs on platforms will tell you how the train runs and printed signs taped up will tell you modifications to different lines. 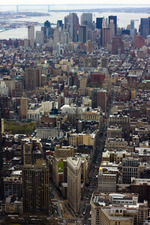 Manhattan is mostly gridded. Avenues run north/south and are spaced further apart. Streets run east/west and are often very close to one another (just a few buildings on each block). When walking from one avenue to another, the blocks are much longer than when walking from one street to another. The numbered streets go up as you go north. The avenues go up as you go west. Some of the Avenues aren’t just numbers (e.g., Lexington Ave. that comes after 3rd Avenue when moving west). This can help you figure out what direction you are going and need to go. Once you get further south in Manhattan and out of the numbers…sorry, you’re on your own. Down there, I’m typically on my phone for help navigating. NYC brings people from all over the world together in one city. In addition to the various cultures present in the city, there are also very distinct neighborhoods that sometimes relate to a particular culture. I love to just walk around the city, exploring different neighborhoods. One of my favorite randoms is that you can be in Chinatown, go one block and find yourself in Little Italy and know it. (A Simpsons episode referenced this.) I’m no expert about the different areas, but definitely have become an experienced explorer. Just use common sense and trust your instinct about your surroundings. Feel free to ask people for their favorite spots and that can be a good starting point for further exploration. All the places I mentioned above and many more are on the map below. Let me know if you have suggestions in addition to these and I can add them to the map and check them out myself if I haven't already!